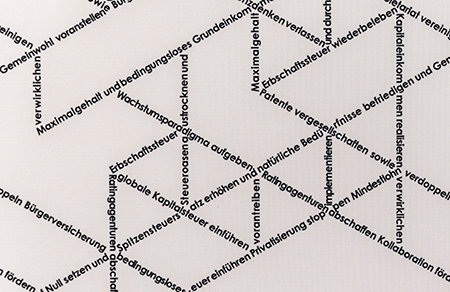 visualizes new approaches to humane economics, experiments with radical strategies for social justice, and offers possibilities for becoming active in the quest for a fair economy.Turbo-capitalism based on permanent growth is responsible for the exploitation of our lebensraum and the prevailing social injustice. Both are a threat to an open society and democracy. This is why it is important to point out alternatives in theory and practice. What - and to what degree - are we able to change global economic policy? 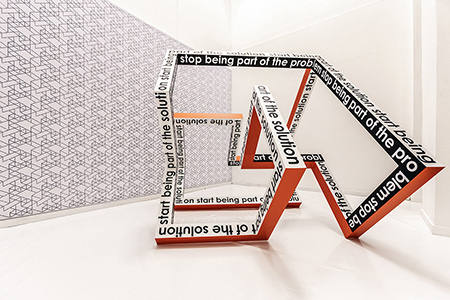 How can each individual make an effort to promote a more just world? 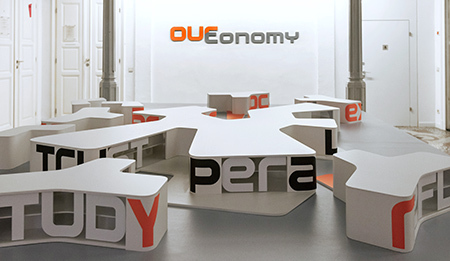 With the project ourconomy (pdf), the artist Lucia Dellefant is developing strategies for a visionary economy. social organism that has dedicated itself to the cause of economic justice. Workers and employees from around the world have joined forces. Chosen by lot from a pool of volunteers from the general population, Creating People serve for a period of five years. 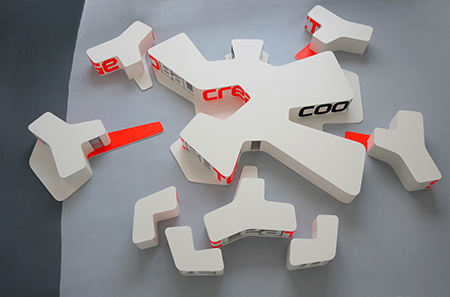 Self-administering, they coordinate services and the production of goods across the globe on a swimming platform. They can moor at 584 Local Creating Centersin all five continents and maintain a dialogue with the local citizenry. Nation states have entirely handed over the responsibilities of the employment agencies and the development of production methods to the direct democratic Global Creating Center. In seven departments that moor on the central ship, the Creating People jointly develop high global standards so that all people can work under the same fair conditions. The STUDY Department offers each and every individual fields of work in accordance with his or her own abilities and wishes. The goal is to discover each person's passion and where appropriate open up new horizons. Based on the results from the CREAT and REFLECT departments, job profiles for new lines of work are developed and introduced here. All citizens receive an unconditional capital stock that is distributed by an international foundation. For work rendered, by contrast, the EXCHANGE Department offers diverse remuneration models, for example compensatory measures, money or time allocations. Maximum and minimum salary caps are democratically determined here and care is taken that the difference between the two salary levels does not exceed tenfold. In order to ensure a demand-oriented mode of production, Creating People from the NEED Department determine how many units of a product are actually required based on computerized simulations and crowdvoting. This information is collated with the HAVE Department. 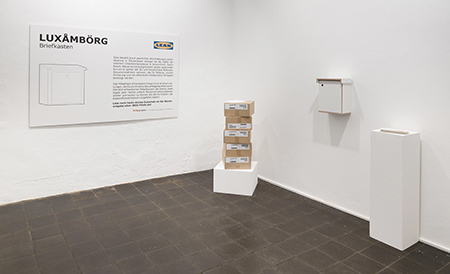 They investigate which resources are available at which places, which materials can be reclaimed by means of recycling and where it is makes sense to produce something from an ecological point of view. In order to do justice to this claim as regards generating its own energy, the Global Creating Center solely makes use of water, sun and wind energy. 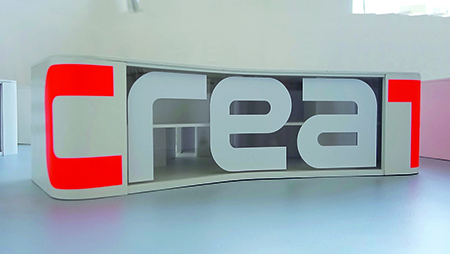 The TRY creating team promotes innovations. It tests economic models and experiments with technical developments in conjunction with up-to-date social and ecological insights. Based on all of such research findings from the NEED, HAVE and TRY departments, the CREAT Department makes recommendations for innovative high-quality products and services that promote bonds between people. Globally, 95 % of companies and businesses have joined the Global Creating Center and develop the production methods and procedures necessary for this purpose. All departments are in constant contact with each other and share their knowledge with the REFLECT Department. Thanks to this feedback, this department can permanently question the Global Creating Center's own methods and optimize them as required. Generously sized meeting points inside the center's building and in the courtyard facilitate personal dialogues. 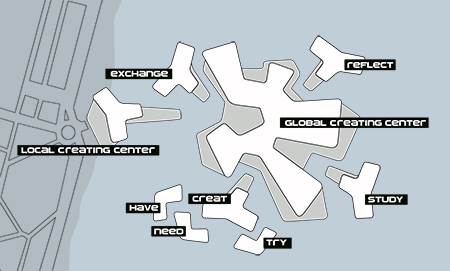 The possibility to moor at various places on the platform or visit a Local Creating Center alone fosters contact to people from other regions. Especially for an internally active organization, such cross-cultural learning procedures that enable an open discourse are essential. The terms on the outer walls of the modules are not only structuring elements of the architecture but also inform visitors about the activities and values to which the Global Creating Center has dedicated itself: transparency, cooperation, trust and love. 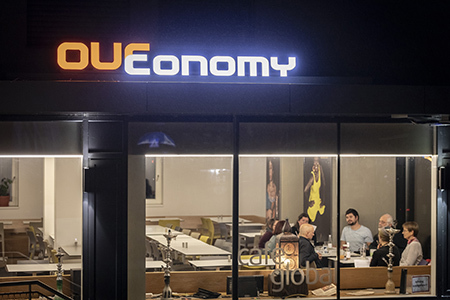 As such, the Global Creating Center makes a considerable contribution to a humane economic order in which solidarity represents the greatest good in interpersonal dealings and in which companies, businesses and institutions are obliged to the common good and operate in harmony with humankind and nature. 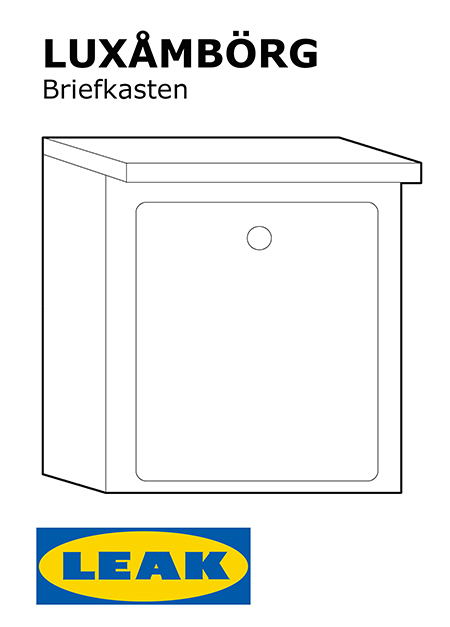 By the skilful shifting of its profits to tax havens, IKEA pays virtually no corporate tax in Germany. By means of these tax-evasion systems used by globally operating corporations, billions of euros in tax revenue are lost to the European Union and Germany that are urgently needed for education and social welfare. 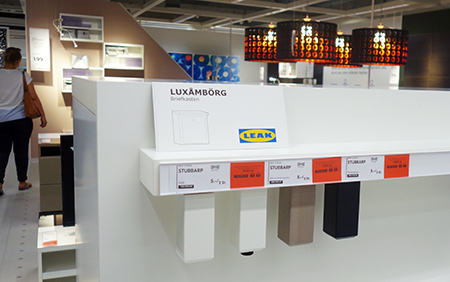 In this country, IKEA does not contribute to the financing of the welfare state and public infrastructure, which, however, the furniture house takes advantage of as a matter of course in promoting its social image. Therefore, you are offering IKEA a free service. 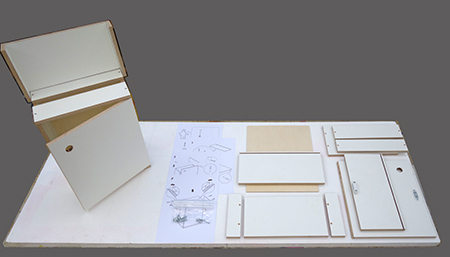 Give the Swedish furniture company the chance to rectify their legal but unfair tax-evasion practices until the EU states have introduced unitary taxation! 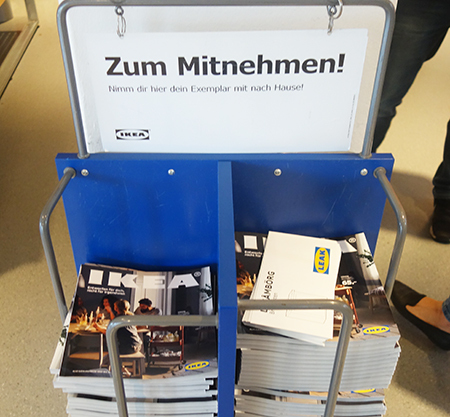 Hand in your voucher today at the goods collection area in an IKEA store! 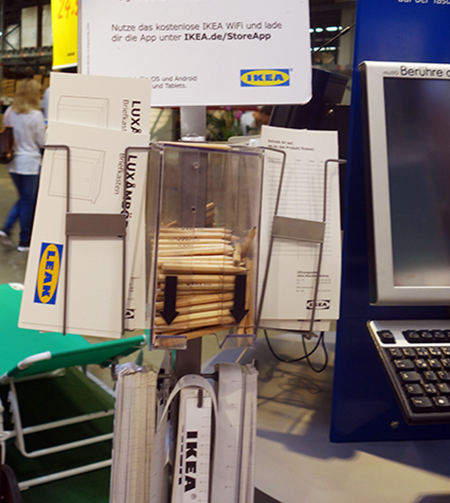 At the IKEA store in Eching / Munich, Lucia Dellefant puts numerous vouchers in July 2017.